Trusses are set into a notch cut in the support post to maximize load-carrying and uplift capability. The truss are then nailed to the columns. All trusses are factory built and computer engineered to meet specific loading capability of each individual building. They can also be designed for a ceiling load for sheet rock. See the Kootenai County Snow Load Map (13Mb) for specific loading requirements in North Idaho. 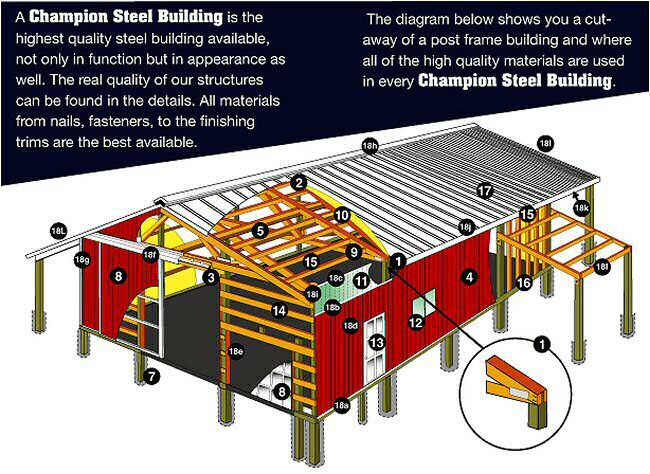 Champion Steel Buildings uses 29 gauge steel panels which are available in a wide range of colors. We incorporate bottom chord bracing (rat run) to fully utilize truss strength. Posts are full sawn material, grade stamped pressure treated (0.60 CCA), set at the poper engineering depth and backfilled with concrete. Posts can range from 6" x 6" to 6" x 12". Doors can be placed in most locations of your buildling, and are engineered for ease of operation and minimal maintenance. 3' 0" x 6' 8" raised panel doors are equipped with keyed exterior lockset and custom trim. K.D.F.L. 2" x 6" or 2" x 8" (depending on engineering) lumber is spaced 2' O.C. to support the wind loads being applied to the walls and to provide area for screw fasteners. 2" x 10" pressure treated mud board keep sidewall metal from ground contact, protect against rot and decay and function as contrete forms for pouring the floor as well. Screws color matched to your exterior steel is standard. We also predrill our steel for straight lines (no chalk lines or pencil marks). Available in a variety of colors to provide an attractive matching or contrasting compliment to your building. See our photo album for examples. Base trim seals the bottom of the sidewall panels to prevent insect or rodent infiltration. Wall light trim provides a smooth transition from sidewall steel panels to wall lights. Eave trim give a clean finished look at the top of the sidewalls. "C" trim covers cut steel edges around the overhead and entry doors and windows. Jamb trim covers the jambs around your overhead door openings to eliminate the need for painting. Track covers supported by interlocking brackets, keep out the weather and protect door hardware. Gable and corner trim gives your building that finished look and seals up the building. The ridge cap is fastened with color matched screw fasteners, as are all of our trims, to seal off the peak completing a weather-tight roof system. Facia trim covers the wood facia on overhangs so you have that finsihed look. Soffits on an overhang add that finished touch and prevent birds and bees form nesting. Allow us to give you a free quote on your next project.